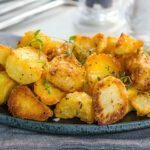 Learn how to make perfect Roast potatoes with this foolproof recipe for roast potatoes that come out perfect every time! 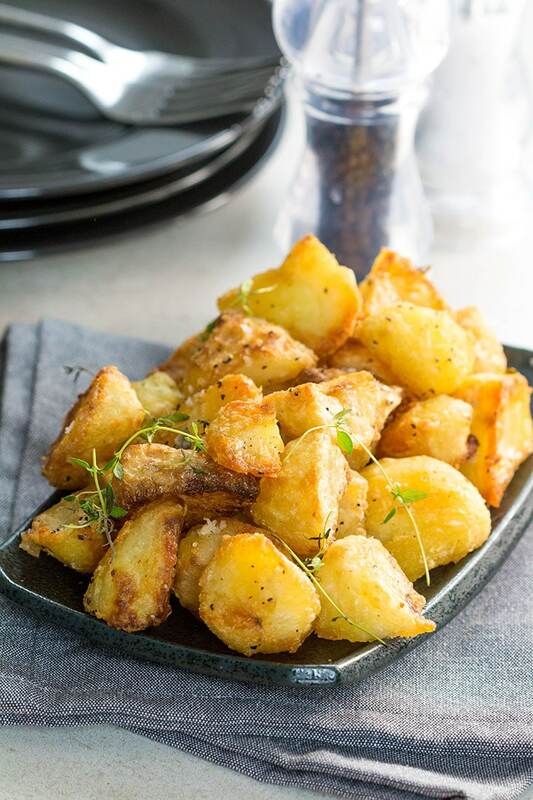 This recipe for Perfect Crispy Roast Potatoes makes oven roasted herb potatoes with a crisp exterior, and a delectable soft, fluffy center. This recipe is the perfect example of what roast potatoes should be! They are super crispy, and simply seasoned with fresh thyme and salt and pepper. Sometimes simple is just better – Especially when it comes to potatoes! These roasted potatoes are made using just 5 ingredients making them super simple to prepare. They’re the perfect side dish for a busy weeknight dinner or fancy holiday spread! Just the right amount of olive oil makes the potatoes crisp without becoming greasy. Simply seasoning them with salt and pepper and a hint of fresh thyme allows the potatoes to remain the star of the show. Roasting potatoes are super simple and so delicious. 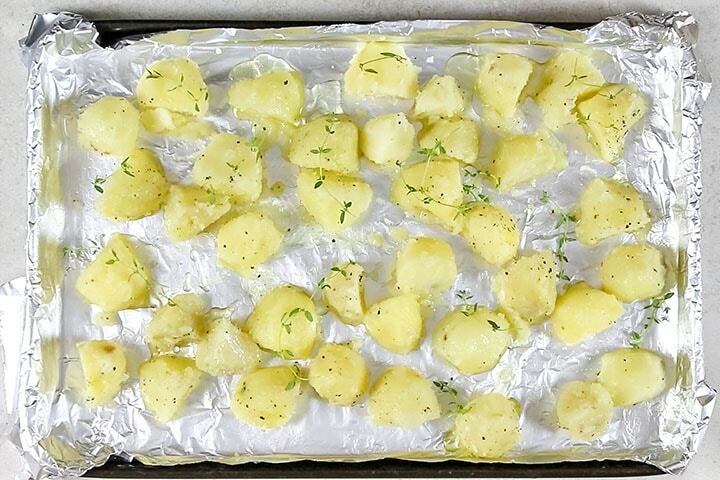 All you need is a baking sheet, white potatoes, olive oil, fresh thyme, and seasonings. Give them a toss in a mixing bowl, add them to the baking sheet and roast until they’re crispy and golden. In the US, the best potatoes for roasting are Yukon Gold or Russet (although, blue and purple potatoes work great too if you can find them). In other countries, a good rule of thumb would be to find a potato that has enough waxiness to hold its shape and develop nice golden color on the outsides, while having enough starch to make the interior light and fluffy. In the UK King Edward work well, In Australia Dutch Cream are good all round potatoes. Most recipes will tell you to start with cold water when boiling potatoes. This is because boiling potatoes in hot water will cook the outside of the potato faster than the inside resulting in an uneven cook. 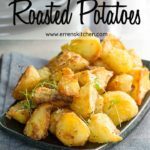 That logic is great for boiled potatoes, but for roast potatoes, starting with potatoes that are cooked on the outside, and undercooked inside is perfect for achieving a crispy exterior. Once drained and dry, gently shake the potatoes in the strainer to rough up the cooked exterior. This will result in a perfectly crisp roast potato. Start with peeling and cutting the potatoes. I cut mine into pieces a smaller than a ping-pong ball. 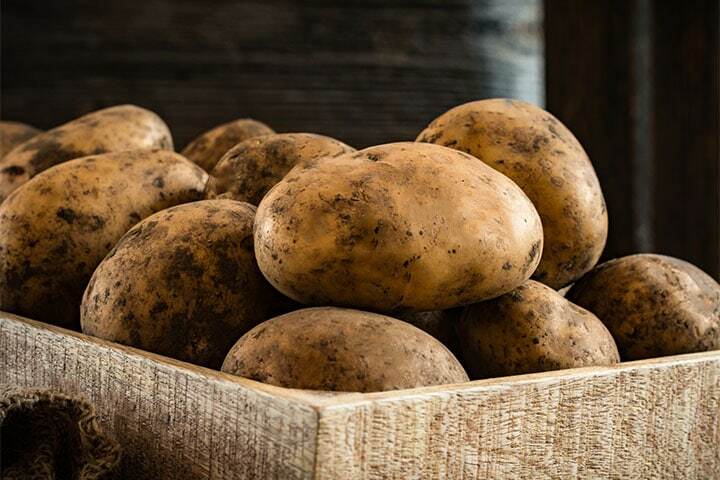 Wash the potatoes in cold water to remove any extra starch then add them to a large empty pot. Boil water enough water to cover the potatoes well (about 2 inches higher than the potatoes) pour over the potatoes, salt the water, and parboil for 5-7 minutes. Drain in a strainer and leave dry. Once dry, gently shake the strainer to rough up. Add the potatoes into a large bowl. Add the oil. Add the salt and pepper, gently stir to coat. Transfer to a baking sheet in one layer, and add the fresh thyme. Roast in the hot oven for 40 to 45 minutes, or until crispy and golden brown. Transfer to a plate lined with paper towels to drain off any excess oil and serve hot. 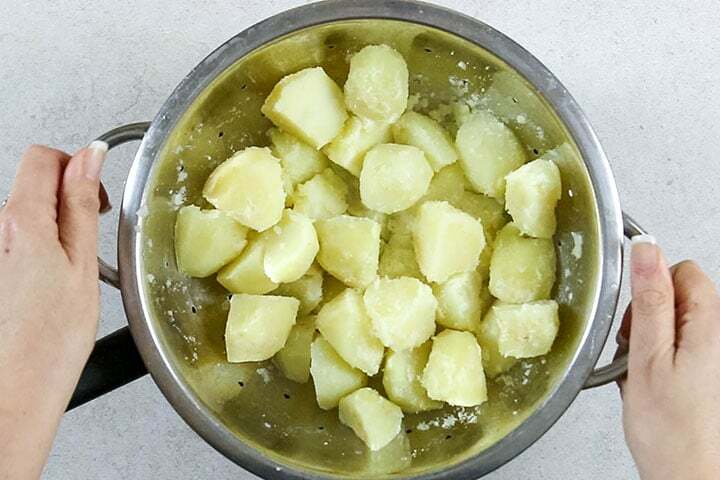 To safely add the potatoes to the boiling water, add the potatoes to the empty pot, boil the water in a kettle and then pour over the potatoes. This keeps you from having to drop them into the hot water and getting burned by the splash. 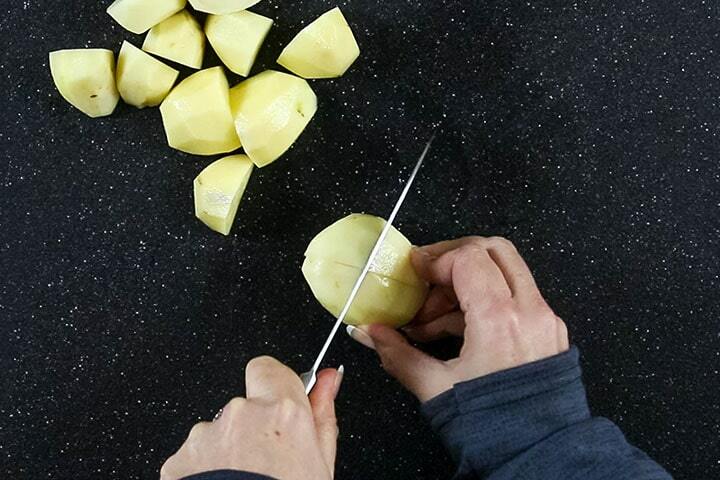 To tell if the potatoes are parboiled enough, insert a sharp knife into a potato. They are done if the knife slides in fairly easily, but meets some resistance in the center. Don’t overcrowd the potatoes on the pan. Overcrowding will cause heat from the pan to get trapped under the potatoes and cause them to steam instead of roast. For extra crispy potatoes, turn them in the pan halfway through the cooking time. 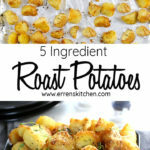 Can you parboil potatoes the day before roasting? 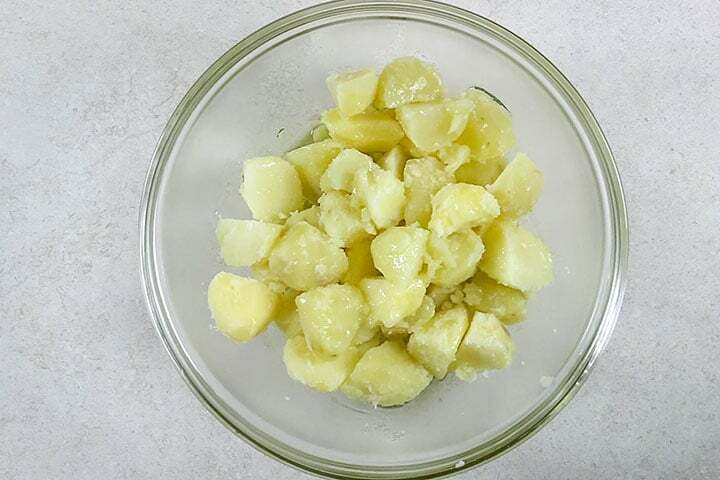 To parboil potatoes the day before roasting, parboil, drain, rough the outside and coat with oil the day before. Then simply cover them with plastic wrap and store in the fridge until needed. How to store peeled potatoes overnight? 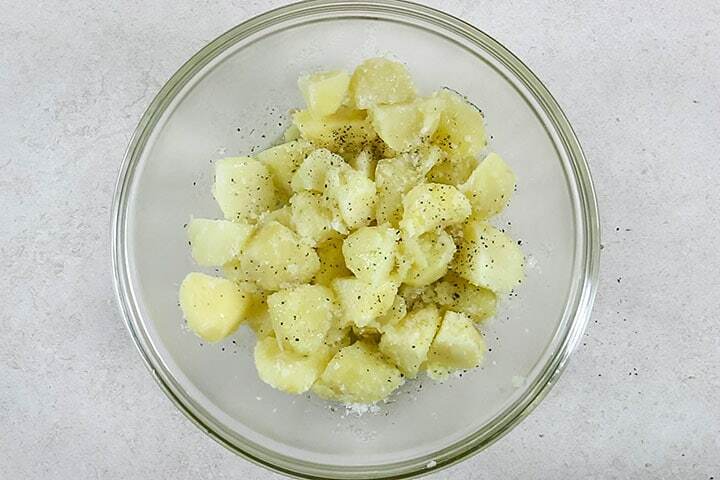 The best way to store peeled potatoes is to cover them with cold water to keep them from turning brown. Don’t store them this way any longer than overnight as they will start to lose their structure. Can you Freeze Roast Potatoes to Make Ahead? To make ahead and freeze roast potatoes, parboil, drain, rough the outside and transfer them to a baking sheet or dish in a single layer. Loosely cover them with plastic wrap and freeze. Once frozen, transfer to a freezer bag and return to the freezer. To roast from frozen, heat the olive oil in a large roasting pan for five minutes in the oven. Carefully add the frozen potatoes to the hot oil and turn to coat. Cook for 45-50 minutes, turning in the oil halfway through until golden and crisp. Peel the potatoes, cutting any larger ones so they’re uniformly sized. I cut mine to be a little smaller than a ping-pong ball. 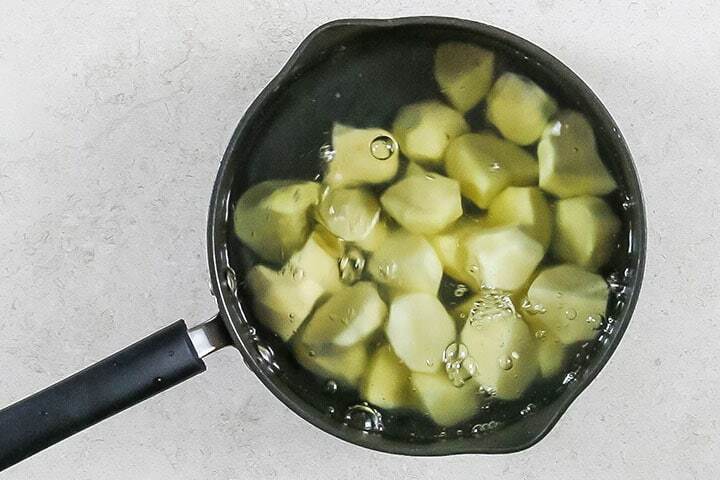 Wash the potatoes in cold water to remove any extra starch then add them to a large empty pot. Boil water enough water to cover the potatoes well (about 2 inches higher than the potatoes) pour over the potatoes, salt the water, and parboil for 5-7 minutes, then drain in a strainer and leave dry. Once dry, gently shake the strainer to rough up. Add the potatoes into a large bowl. Add the oil, salt an pepper, gently stir to coat and transfer to a baking sheet in one layer, and add the fresh thyme. Roast in the hot oven for 40 to 45 minutes, or until crispy and golden brown. Transfer to a plate lined with paper towels to drain off any excess oil and serve. Don't overcrowd the potatoes on the pan. Overcrowding will cause heat from the pan to get trapped under the potatoes and cause them to steam instead of roast. My family would LOVE these!! They sound incredible! Thanks Katerina, funny story behind these, we actually ate them, then realized we didn’t have enough for a shot, guess who had to make more! Lesson learned haha! They did in mine too, them naughty hands get everywhere! Looks fantastic! Definitely a huge hit in our house, need to make this soon! Thank you, Melanie, They are so easy to make too! I love homemade, crispy potatoes! My kids will love these! Thank you so much for your awesome feedback, Beth! I need to make these for dinner tonight! 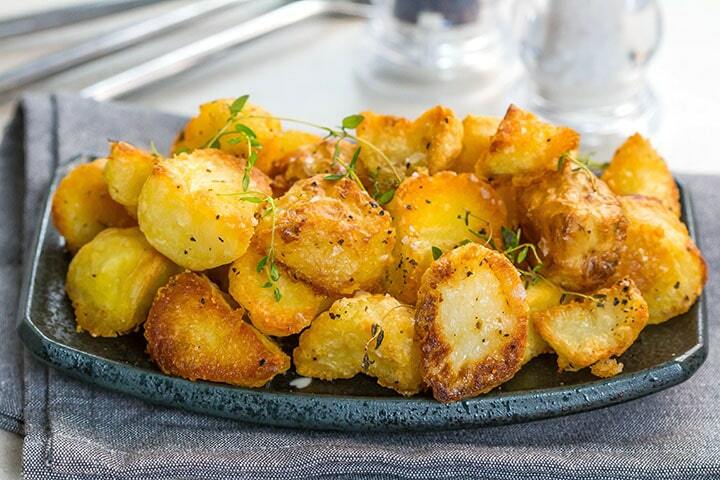 These potatoes look heavenly! These look seriously crispy and delicious!! Nothing like a crunchy Potato! Perfect is an understatement these look absolutely delicious! Made these last night – AMAZING!! Thanks Erren! Thank you, Gina, for your feedback! I’m Glad you enjoyed! I Love when you make these! BEST roast potatoes EVER!